teacher gifts-1, originally uploaded by Beaty Family Fun. I made these little zipper pouches for my son’s preschool teachers. Tucked inside each one was a matching coffee quilty, a key fob with a charged up Starbucks card on it, and a card. I think these little gifts were a hit! The floral fabric was a find at Joanns. I found three precut fat quarters and THAT’S IT! I’d love to find more. It’s got all my favorite colors in it. Love, love these!! Can you be my secret santa this year at work?? Ohhhh, that IS a great print! I will check MY joanns and see if I can score some more! These little goodies are so fabulous! LUCKY TEACHER! Emily – that fabric reminded me of this print – from my favorite wedding ever featured in an MS Weddings. His hanky and cuff link! VERY nice, Abi. Those are some lucky teachers! Are you gonna put some of these on your ETSY? These would sell like hotcakes! Great gifts. These are adorable! Where were you when I was doing teacher gifts? I’m totally keeping you in mind for next year! Wow, very professional, and fun too. The teachers were treated well! Super cute. If you ever want to make and sell these, I’d like to purchase some for gifts. Thanks, everybody! The funny thing is these take half the time and effort of a camera strap – I guess I should put some in the shop! That is great fabric!! 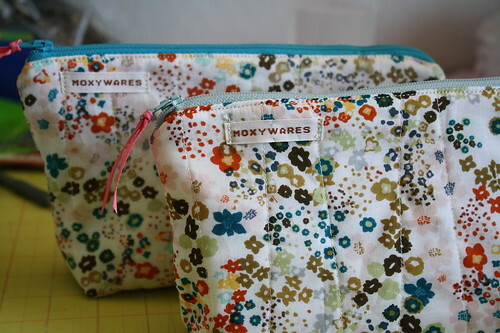 Where did you get your moxywares labels from, I think you told me once before, but I need some for some things I am making for an etsy store and I like yours a lot! Those are great! Yes, you should put them in the shop. I bet they’d sell well. this is kelly – i met you at the “field trip” today. i picked up that same print at joann’s a while back. i think i only found 1 or 2 FQ’s of it, and i have no idea what to do with it, but i just couldn’t resist! those are very cute. It was great to meet you today, Kelly! Katie, I get them from Namemaker.com. If you sign up for their email list, they’ll send discount codes every once in a while. The labels are kind of pricey, so it’s worth waiting for a 20% off code. Totally awesome gifty ideas. Beautiful execution as well! 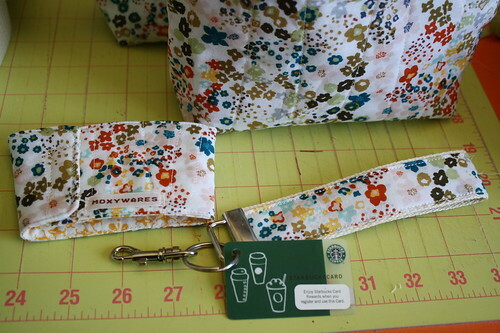 Funny, I found 3 FQ of that exact fabric at my JoAnn’s but on a black background! I might have to go back and see if I can find it on white. Haha!